I've just spent an unexpectedly warm and sunny weekend in a relatively quiet, small seaside town. This final weekend before schools start again meant the beaches, stretching for miles, were barely half-full, so there was plenty of space for games and kite-flying, and for children and adults to splash and run around in the waves. And plenty of evidence, too, of traditional beach pastimes: a long trench being dug for the gradually advancing tide, and, along the shore, where the surface was smooth and damply soft, names and hearts and other signs etched into the sand. Transient, temporary greetings and declarations of love, to be smoothed and washed away within a few hours by the subtly yet inexorably encroaching tide. 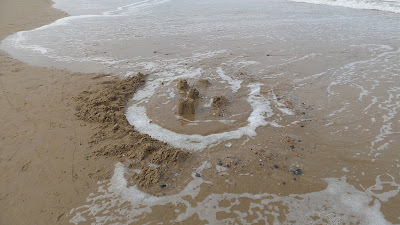 And today, as I watched the sandcastle softly, gracefully crumble into the sea, and hearts and names fade and disappear, I also noticed something else. Each receding wave left something behind. Dozens of pebbles of all shapes and hues, the odd feather or piece of glass where previously there had been only sand; not quite a coral castle, true, but the sea's offering, nonetheless. When the sea comes calling it takes away, yes; but the sea - palely mirroring God - also gives: not like for like, measured out, but more, and abundantly, from the vastness and variety of its bounty. thank you SO much! what a stunning reflection and the poem is.... just wow. Thank you for sharing this reflection and the poem! just wow!!! !